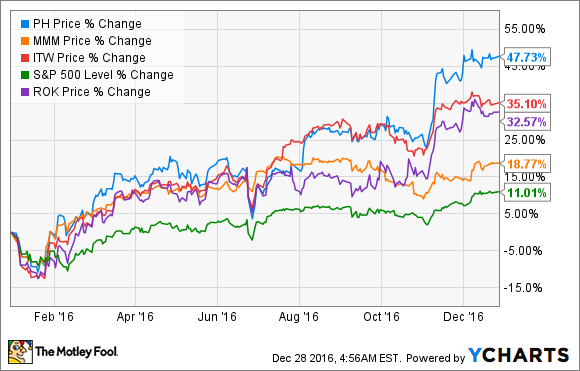 Why the industrial stock wins out over peers like Illinois Tool Works, 3M Company, and Rockwell Automation, and what makes it a buy for 2017. Those who follow the industrial sector will know it's outperformed the S&P 500 over the last year. Stocks such as Illinois Tool Works (NYSE:ITW) and 3M Company (NYSE:MMM) have delivered market-busting returns, and it's tempting to think that the anticipated recovery in U.S. industrial production in 2017 is already priced in. However, I believe there is still a strong investment thesis for buying into one of the best-performing industrial stocks in 2016: Parker-Hannifin Corporation (NYSE:PH). As you can see above, Parker-Hannifin stock is up nearly 50% in 2016, but unless you favor technical analysis, it's usually a good idea to ignore price charts and focus on the value of a stock itself. The good news is that Parker-Hannifin is reasonably priced and has good growth potential. The chart below shows how the stock is cheaper than some of its peers. EV simply means enterprise value (market cap plus net debt), and EBITDA is earnings before interest, tax, depreciation and amortization. 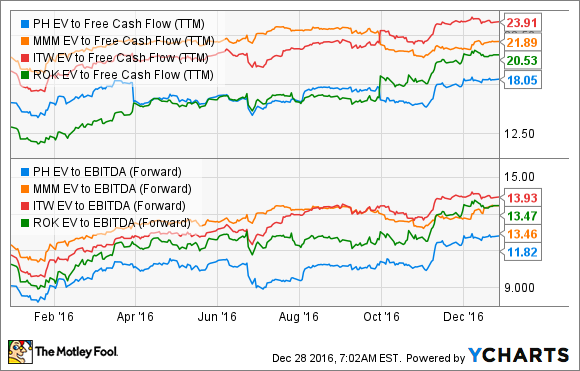 Free cash flow (FCF) is used because it's the best way to judge the potential a company has to pay dividends. PH EV to Free Cash Flow (TTM) data by YCharts. So, Parker-Hannifin is a good value on a current basis -- but what about growth and forward valuation? 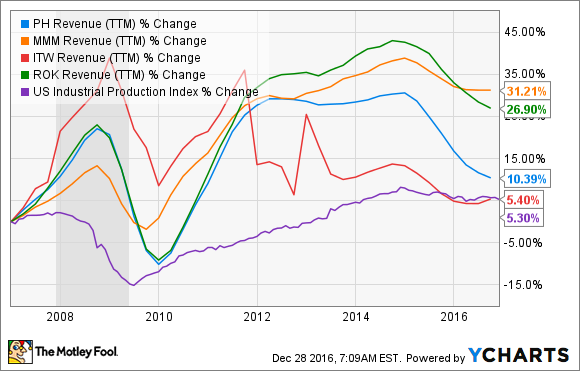 There is upside from a return to "normal" industrial production growth in the U.S. in calendar year 2017. CLARCOR Inc is a complementary acquisition in filtration and adds strong recurring revenue (80% of CLARCOR sales are in the aftermarket), particularly in the U.S.
Quarterly orders have turned positive for the first time since December 2014. The company has a strong record of FCF conversion. It has plans to expand segment operating margin to 17% by 2020 from 13.9% in fiscal 2016 -- its fiscal year runs to the end of June. It has cheap forward valuations based on management's projections. The company prides itself on being "the global leader in motion and control technologies," and as such its end market exposure is highly diverse. 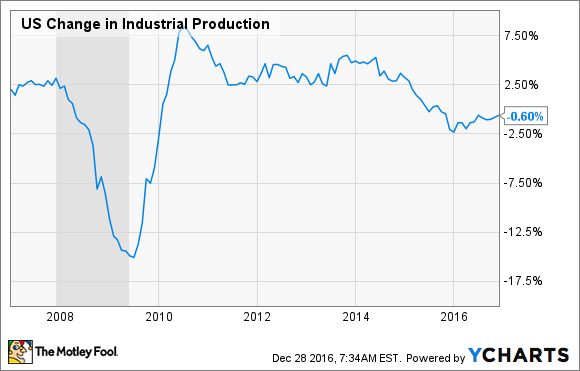 Simply put, it's a broad-based play on industrial production. However, as with Rockwell Automation Inc (NYSE:ROK), its reliance on capital spending means its revenue fluctuates much more with changes in industrial production than the revenue of, say, 3M Company. This is because companies commit to expansionary capital spending when the economy is good, and cut it when conditions turn down, while operational spending tends to be more stable. You can see this in the following graph -- compare Rockwell and Parker-Hannifin with 3M. PH Revenue (TTM) data by YCharts. Indeed, management believes it can grow revenue 150 basis points above industrial production growth, so if the latter bounces back to the 3% growth rates reported in the 2012-2015 period, then top-line growth at Parker-Hannifin could be north of 4%. For the record, FedEx Corporation is predicting U.S. industrial production growth will bounce back to 1.6% in calendar year 2017. US Change in Industrial Production data by YCharts. Moreover, Parker-Hannifin's total orders have just turned positive, suggesting the company is over the worst of the slowdown. Data source: Parker-Hannifin presentations. Chart by author. Parker-Hannifin's management believes segment operating margin will expand in the future, and given revenue growth from a stronger industrial economy, analysts have its earnings growing at a near double-digit rate in its fiscal 2018-2020. That compares favorably with 3M's target for earnings to grow 8%-11% in 2016-2020, even though the midpoint of 3M's forecast EPS growth range for 2017 is just 6%. Furthermore, Parker-Hannifin's strong history of FCF conversion from net income (averaging 120% in the last 10 years) makes it more attractive than Illinois Tool Works (100% conversion in last 10 years). The latter also has margin expansion plans and double-digit growth prospects, but its valuation is higher -- as is Rockwell's. Turning to valuation, the following chart shows you analyst consensus EPS forecasts, and FCF per share assuming a 120% conversion rate, and then the EV/FCF multiple (compare with the second chart above) with the conservative assumption of no share buybacks. Data source: NASDAQ.com, company reports. Chart and analysis by author. EPS and FCFps are in U.S. dollars, EV/FCF is a multiple. Is Parker-Hannifin stock a buy? Based on the arguments above, and forward EV/FCF projections, the company is a better value than its peers. It contains a similar cyclical risk as Rockwell, but offers more reward, and has stronger growth prospects than stocks with richer valuations such as Illinois Tool Works and 3M. Despite the strong rise in 2016, Parker-Hannifin is still an attractive stock to buy.